KATHMANDU, Nepal — Rescuers in Nepal have pulled a man from the wreckage of a building where he was stuck for a staggering 80 hours after the devastating earthquake that hit the country Saturday. His survival is unusual, as experts say it’s rare for injured people who are trapped to hold out for longer than 72 hours after a disaster. The man, Rishi Khanal, was saved after a French search and rescue team found him under the rubble on the outskirts of Kathmandu, the capital, around noon Tuesday, said Pushparam K.C., a spokesman for the Armed Police Force of Nepal. The team used specialized gear that detects signs of life, he said. But it took about 10 more hours for the French team and police officers to dig him out, the spokesman said. At least one name has come to the fore of quake relief so far Film Industry is concerned. We are all aware of the recent natural disaster that hit Khatmandu. Our prayers to those families, who got effected due to this calamity. Telugu actor Ram Charan has extended a helping hand to the victims of the devastating earthquake in Nepal, offering relief material with the help of Apollo Hospital. The corporate hospital will be shipping large quantity of ORS sachets,glucose bags and cough syrup to the quake-hit people in Nepal,” revealed a Press note from the actor. Members of Chiranjeevi Charitable Trust and the huge fan base he commands are expected to join hands with the actor in this endeavor to help people of the catastrophic calamity. The actor is currently busy getting ready for the shoot of his yet-untitled Telugu film with Srinu Vaitla. Rishi Khanal spent about 80 hours in a rubble-filled room with three dead bodies after the seven-story building he was in collapsed around him during Saturday’s massive earthquake in downtown Kathmandu. The 28-year-old was finally pulled out of the rubble on Tuesday, Reuters reports, by a Nepali-French rescue team combing the capital city for survivors. “It seems he survived by sheer willpower,” said Akhilesh Shreshtha, a doctor who treated him, after it appeared that Khanal had no access to food or water for three days and escaped with nothing but a possible broken leg. Khanal’s rescue was a heartening but rare story from the devastation in Nepal, where a 7.8-magnitude earthquake over the weekend killed more than 5,000 people. That toll is sure to rise significantly as rescue teams move away from Kathmandu, which they began to do early Wednesday, and reach devastated villages near the quake’s epicenter. Its an assurance so far that relief works are going very promptly in Nepal………………although affected rural areas are still remained untouched due to poor communication……………I believe the situation is worse there. Since people are staying mostly outside and denied to take shelters inside house apprehending further casualties some words[read practice] of cautions should be maintained in a proper way. First is personal hygiene and proper disposal of human waste………….. next is care should be taken about drinking water third is proper medication and following the medical instruction…………..instead of getting panicky people over there should believe the entire World is standing by their side so better take good care of themselves and their health because there are high chances of breaking out epidemic [either water borne or human waste borne] if care is not taken. So be careful and stay safe. I was contacted this morning by 30-year-old Rich Birkett, a British tourist who had been trekking in the Himalayas with friends when the monstrous 7.8 magnitude earthquake tore through Nepal on Saturday. After an exhausting four day, 45 kilometre cross country hike through Nepal’s devastated villages, Rich and his friends have finally arrived safely back to Kathmandu and are currently planning their exit out of Nepal. “We were on a bus on the way to Langtang National Park when the earthquake hit, we weren’t sure what was happening but as the quake got worse it became clear as the people in the small village we were in started running out of their houses. Article of the Week: Human Behavior in the Face of Disaster and Loss. The shock of the past few days in Nepal gave way to despair, frustration and a few larger questions on Tuesday, as the death toll from the devastating earthquake that wracked the small Himalayan nation over the weekend rose above 4,000 — a number that will almost certainly rise once international rescue teams reach rubble-filled outlying areas surrounding the capital, Kathmandu. The massive quake, measuring 7.8 on the Richter scale and followed by three days of panic-inducing aftershocks, has left the country — already one of the world’s poorest and least developed — reeling and utterly helpless. But while the earthquake is tragic, seismologists said it didn’t come as a surprise. 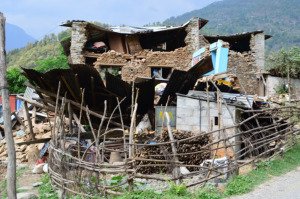 Nepal’s location on a fault line and a lack of emergency resources made a devastating earthquake inevitable, heightening a sense that more should have been done to make typically ramshackle local buildings more resilient, and so saving countless lives. India has ramped up its relief operations in quake-ravaged Nepal, with the focus on deploying medical and engineering teams and restoring road links to speed up the evacuation of hundreds of stranded Indian nationals. More than two dozen aircraft, including heavy lift planes such as the C130J Hercules and C-17 Globemaster, and hundreds of personnel from the military and National Disaster Response Force (NDRF) are engaged in Operation Maitri, making it one of the largest relief efforts mounted by India on foreign soil. With hundreds of Indians stranded in Nepal in the wake of Saturday’s 7.9-magnitude quake that killed more than 3,700 people in the Himalayan nation, officials are focusing on opening up damaged roads so that people can be evacuated in buses because the number of flights from Kathmandu airport is limited. Till Monday evening, the Indian Air Force had airlifted 2,246 people in more than a dozen sorties despite bad weather and an aftershock that briefly shut the Kathmandu airport on Sunday. However, many more Indian tourists and pilgrims were stranded in the Nepalese capital and other places. Plans have been drawn up to evacuate people in a fleet of buses once roads linking Nepal to the Indian states of Uttar Pradesh and Bihar are repaired and opened. The relief teams will have their work cut out for them as several roads and highways were blocked by landslides triggered by the massive quake and dozens of aftershocks, officials said. A total of 150 Indians who reached the border at Raxaul in Bihar on Monday morning were sent to their homes by train by the state government. Ten buses were sent to Pokhara in Nepal to bring back stranded citizens, said Vyas Jee, principal secretary of the disaster management department. In view of the massive scale of relief operations, India sent three top military commanders, led by Major General J S Sandhu, to Nepal on Sunday to coordinate and fast-track rescue and evacuation efforts. The senior officers from the army and air force will work with NDRF chief O P Singh, who is camping in Kathmandu, and Nepalese authorities. The Indian Army has already sent 10 Inmarsat systems for satellite communications to Nepal. The quake caused widespread damage to communications infrastructure and phone links were disrupted at many places. Defence ministry spokesperson Sitanshu Kar said six medical teams, engineering task force components, blankets, tents and other relief materials will be flown to Nepal by the air force on Monday. The air force will also complete several sorties that were aborted on Sunday because of aftershocks. Kar said four light helicopters would be stationed at Pokhara to enhance relief operations. A Rapid Action Medical Team of the IAF began functioning at a first aid centre in Lagankhel, eight kilometres from the Kathmandu airport. Army teams will bring the injured to the centre manned by three doctors and 25 paramedics. The Indian personnel are working closely with hundreds of retired Gorkha soldiers of the Indian Army. India has already provided 10 tonnes of blankets, 50 tonnes of water and 22 tonnes of food donated by states and voluntary agencies. Prime Minister Narendra Modi, who chaired a meeting on Sunday, is personally overseeing the planning and execution of the relief operations and evacuation of stranded Indians. Home minister Rajnath Singh said on Monday that India will do everything possible to help Nepal. “We had held a meeting chaired by the Prime Minister and many decisions have been taken so that we can provide the maximum help to Nepal,” he told reporters.